THE SAINTS GO MARCHING ON. Continuing their winning run, St Duthus recorded a 2-1 win over Orkney in Kirkwall this afternoon, having made what was their first ever journey to the Orkney Islands, ending a 22-month home unbeaten streak for the Orcadians. Departing with a squad of just thirteen, accompanied by a handful of travelling supporters, the Saints made the ferry trip across the Pentland Firth from Gills Bay and were warmly welcomed by their Orkney counterparts when they arrived. After the teams were piped down the pathway to the 3G pitch at Kirkwall Grammar School, the players took to the field in front of a sizeable home crowd. As they did in the Tain fixture between the two sides, though, the Saints stunned their opponents when they took the lead in the second minute of the game. A free kick from Jon Campbell led to Scott Miller sharply reacting to pounce on a loose ball to send it past Cameron McConnachie, netting his fifth goal in just three games. Just a few minutes later the Saints may have doubled their lead when Campbell once again delivered a threatening free kick into the box. This time his effort reached the head of Ken Morrison, and the midfielder powered the ball goalward before McConnachie diverted the ball onto the crossbar with the slightest of touches. The Orkney men retaliated moments later and on ten minutes they were awarded a penalty after their striker was adjudged to have been fouled in the box. However, for the third time this season Steven Martin saved and held the spot kick, keeping out Chris Simpson's low effort from 12 yards. The save offered only a temporary reprieve as the islanders eventually restored parity just after the quarter hour when Graeme Horne lashed the ball past Martin with authority from just outside the box. The game took an ugly turn when some questionable officiating became the main talking point. Playing his first game since signing for the club, Liam Mcleod was left astounded on the quarter hour after he was shown a straight red card for foul and abusive language, reducing the Saints to ten men. The dismissal followed a rough collision between Jon Campbell and Steven Edwards which had led to a booking for Edwards, and frustration began to set it in as it appeared as though the Saints were going to be in for a long afternoon. Unable to break down their stubborn visitors, Orkney were being closed down well in the wide areas and struggled to send balls into the box. The Tain men defended well for the remainder of the first half, and for the best part of twenty minutes they played with a man disadvantage. That was until the Orkney men were handed a red card of their own, also for foul and abusive language, when substitute Kyle Drever was dismissed. Alas, the first period ended with more people talking about the refereeing decisions than the game itself, albeit with honours even in terms of playing personnel and the scoreline. Continuing on with the same level of fight and determination they had shown in the first half, St Duthus were looking increasingly dangerous going forward, and the dynamic Scott Miller was keen to add to his tally, hassling McConnachie and his back line, who were determined to play the ball out from the back. Liam Rostock, having dropped back to compensate for the man less, worked tirelessly in midfield alongside Campbell and Morrison as both sides exchanged possession during the early stages. Both sides had chances wide of the target and over the bar, and corners were exchanged as the game progressed, but good defensive work from both sides ensured that clear cut chances were limited. A great ball from Joe Sutherland played his counterpart wing back Adam MacDonald in on goal with fifteen minutes remaining and the latter forced McConnachie to be at his best with a strong shot on goal. From the resultant corner, Garry Macleod headed just wide. With five minutes remaining, St Duthus snatched the winner with a moment of magic. Collecting the ball 25 yards from goal, Ewan Ross turned quickly with his back to goal to send a looping volley over the head of McConnachie into the far corner of the net. The goal was a joy to behold and was a deserved reward for the Saints' tireless work in all areas of the pitch. The Saints' resolve was tested late on, and a man of the match performance from John Skinner was compounded by some composed defending towards the end of the game, the veteran centre half seemingly always in the right place when it counted up against an Orkney attack who were prepared to throw everything forward in search of an equaliser. On the counter, St Duthus almost made it 3-1 when Jon Campbell broke free on goal, but his effort from close range was blocked and sent clear for a corner. 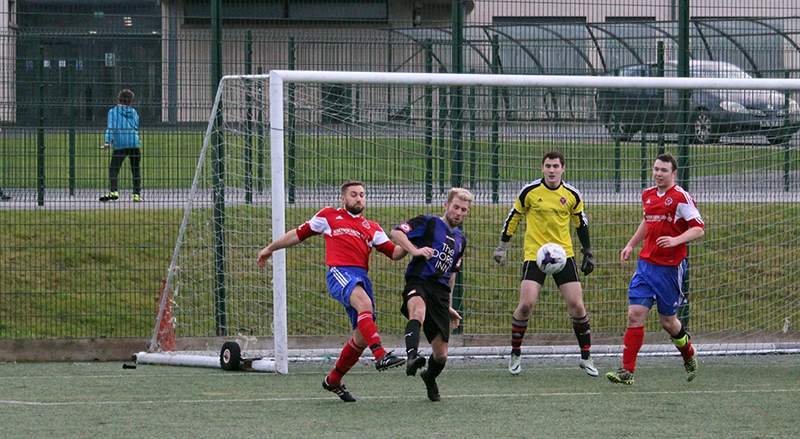 In the dying minutes, Steven Martin produced a great rushing save after coming off his line to prevent a near certain Orkney equaliser, capping off a great afternoon between the sticks, and after a seemingly endless period of injury time, referee Jim Leask blew for time, sending the St Duthus contingent into raptures, handing Orkney their first home defeat since February 2015, ending a magnificent home record for the Orcadians. The win helps St Duthus to 3rd place, albeit with more games on the board than the rest of the league's teams. With three wins in a row (four including the midweek friendly win), the win over Orkney serves as a perfect warm up for next weekend's North Caledonian Cup semi final match away to Golspie, with a place in the final at stake.